Public speaking and leadership require excellent communications and listening skills. Fact is, communication skills are among the most fundamental competences. We use them daily to persuade, influence and navigate our professional and personal lives. Without question, they are absolutely critical to our success. In this first of a series on the skills of emotional intelligence I explore the critical skill of listening and its role in public speaking and leadership. Fact is, this oft lost art of listening that every speaker and leader must master for success. As part of our multi-part series on emotional intelligence, let’s explore what active listening is and how it relates to success the both public speaking and leadership. But first, what is active listening? Listen – We are fully focused & attentive, give our undivided receptive listening. This is not just listening with our ears, but being aware of body language as well. Defer Judgment – Seek first to understand and then be understood. Rather than spend time second guessing another’s communication or ideas we refrain from judgment. Keep Calm – We keep our emotions in check, remaining calm, cool and collected. With active listening we stay focused on keeping our emotions from taking away from our capacity to clearly understand the other. Be Present – We give our undivided attention, putting aside distractions and other environmental stimuli. Our presence will allow us to see and hear the message regardless of the situation. Don’t Interrupt – Don’t think about your answer to the others question. Rather, focus on understanding them fully instead. Show You Are Listening – Use eye contact, nodding and other appropriate body language. This will indicate to the other party that you are engaged. Ask Clarifying Questions – Get feedback until clarity arrives. We should engage and question until we are clear about what is being communicated. Respectfully & Assertively Respond – We should respond with respect for what the other party is trying to communicated. Of equal importance is to be positively assertive of our own insights to build consensus. Just by a quick read of the skills of active listening above you can easily see how they might apply to leadership, communication and public speaking. As a speaker you can put these skills to work with any audience and speaking scenario. You can tune into the body language of your audience, ask pertinent questions of them, and be present. This practice isn’t limited to one on one communications but is equally applicable to communicating with a group. Applying all of these skills to your speaking situations are a critical advantage over those that do not. Likewise, successful leadership requires the EI (Emotional Intelligence) as a habit. Leadership isn’t about command and control but about building consensus and motivating others to want to follow our guidance. With the skill of EI and active listening we are able to build the positive, authentic rapport and relationship with others. When others see we practice emotional and socially intelligence (and that we engage with active listening) – they know we respect them and return this in kind. What are your thoughts on active listening? Where would you use this skill? Want more of posts like this? Let us know. 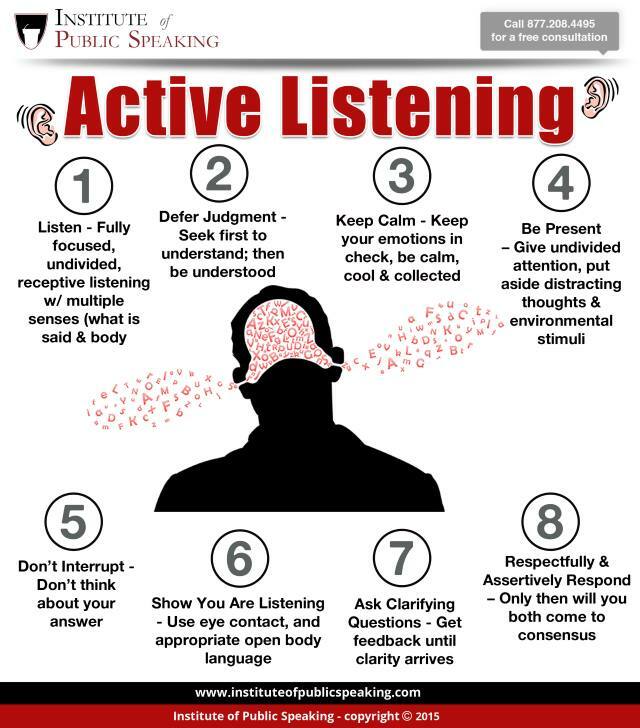 Until then, feel free to share our Active Listening infographic below. Enjoy!